"Constructed as a royal hunting lodge by Maharaja of Alwar, Sariska Palace is placed on the borders of the Sariska National Park. Turned into one of the most popular heritage hotels of Rajasthan, it boasts of an amazing architecture that is a mix of Rajasthani and French styles. The property spans in an area of 120 acres of land, and offers a royal stay amid all the modern facilities and amenities. The guests can savor lip-smacking delicacies of Indian and popular World cuisines at the restaurant and enjoy finest of drinks at the on-site bar. 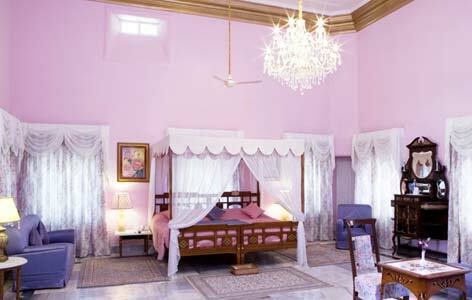 The spacious rooms and suites of Sariska Palace are well-appointed and have opulent interiors. 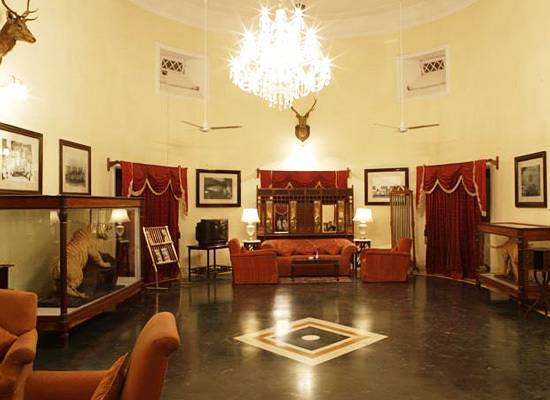 The palace was built in1892 A.D. by Maharaja Jai Singh and designed by a French architect. The structure was raised to commemorate the visit of the Duke of Connaught, the son of Queen Victoria. It served as a royal hunting lodge. There are grand provisions for banquets and parties and other get-togethers. These halls are accompanied with well-manicured lawn which accommodates nearly 1000 guests at a time. The conference room is well- appointed with modern facilities like fax, telephone, internet connection and audio-visuals. The conference room is perfect for official meetings, seminars and product launches. Stay in Maharaja Jai Singh Superior Suite is going to be an unforgettable one with a kingly treatment around all the world-class modern amenities. Originally used by kings and queens of the region, these suites have been modified to suit to the taste of today’s discerning travelers. These air-conditioned suites come with several sofas with comfortable chairs, a king-size bed, a large wardrobe and other facilities such as LCD TV with satellite connection, tea/coffee maker, telephone with STD/IDS facility, mini bar, safety deposit lockers and so on. The attached four fixture bathroom has bathrobe, slippers, bathtub and premium toiletries. Boasting of sheer luxury, the Maharaja Jai Singh Suite offers a memorable quality stay to the guests in a huge fully air-conditioned, well -decorated suite that gas wonderful color palette. Traditional in décor, these suites have all the contemporary conveniences such as safety deposit locker, mini-bar, king-size bed, round the clock room serve, telephone, LCD with satellite connection, tea/coffee maker, and more. Bathtub, slippers, bathrobes, premium toiletries are a part of the attached bathroom. 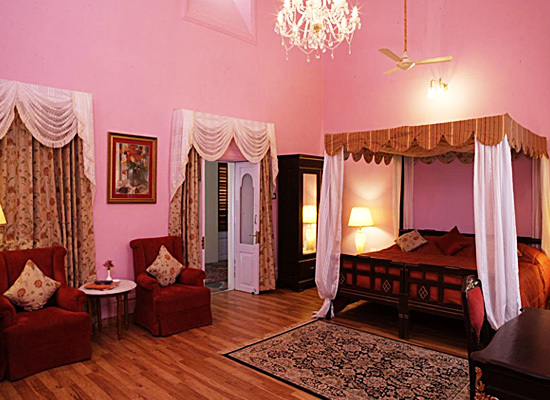 Royal Chambers Superior Suite does not lets you comprise on luxury and comfort during your vacations at Sariska Palace, as they are well-furnished and well-equipped. The warm color palette, vintage furniture, antique carpets, and a traditional décor have been kept intact from the days of yore. The en-suite bathrooms comes with complimentary toiletries, bathtub, hot and cold water, slippers etc. Air-conditioner, tea/coffee maker, room service, direct dial telephone, LCD TV with satellite connection, mini-bar are some of the modern amenities here. Luxury and opulence are synonym of the Royal Chambers Deluxe that come with antique furniture, rich furnishings and traditional interiors. The list of facilities and amenities in this room include bathtub and complimentary toiletries in the attached bathroom, LCD TV with satellite connection, a king-size bed, round the clock room service, telephone with STD/ISD connection, safety deposit locker, mini-bar, air-conditioner and so on. Also termed as haveli, the standard rooms are originally the hunting lodge that was erected by the Maharaja of Alwar, Maharaja Jai Singh for his guests. Boasting of a traditional yet chic interiors, these rooms come with wooden flooring. The haveli lies on the top of a hill and offers wonderful views of the surroundings. Have a memorable stay, amid peaceful surroundings and world-class amenities and facilities such as LCD TV with satellite connection, telephone, tea/coffee maker, attached bathroom with complimentary toiletries, safety locker, room service, king-size/twin beds and so on. 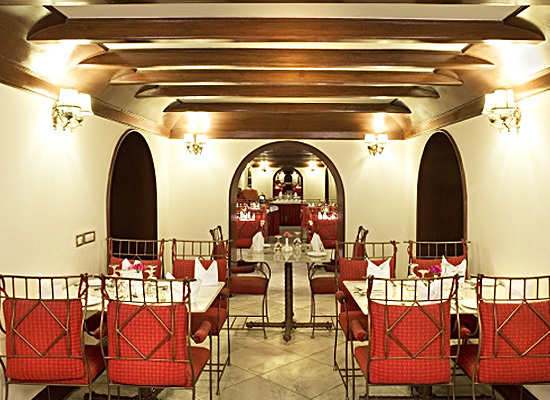 The 80-seat multi-cuisine restaurant at Sariska Palace is huge and has a magical ambiance with royal setting, impeccable hospitality and sumptuous delicacies. The trained chefs prepare Indian and World fares with freshest of ingredients, aromatic spices, keeping high-hygienic levels. Regional delicacies are the highlight. The staff is well-mannered too. Cat’s Whiskers Bar at Sariska Palace is a well-stocked bar where you can relax and unwind while holding a glass of your favorite drink. The bar has a range of domestic and international brands of whiskeys, wines, beer, cocktails, single malts etc., along with a variety of refreshments. Every corner of Rajasthan is significant in the field of history and culture. Alwar is not an exception, and bears all the historical significances. 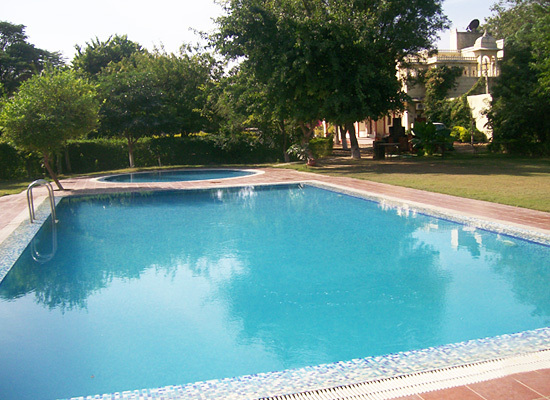 The fort, temples and palaces are the main tourist attractions that keep the tourists busy in their trip to Alwar. Alwar is 180 kms from New Delhi and Jaipur is 110 kms away. Regular bus and train services are available to reach the city.